How About This For Volatility… Getting a Bit Crazy…. 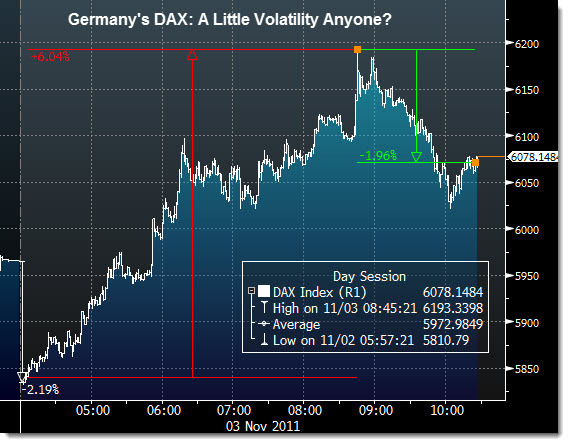 Germany’s DAX index is moving wildly with every rumor and comment regarding the EU bailout. Unfortunately, the swings are going to really hurt investor confidence for some time to come. Just take a look at the intra-day moves over the past few weeks. Below is the ridiculous swings from today… First a 2% gap down on the open, 6% from bottom to top, then a swoon again, down 1.8%! By the end of the trading session, the may me another few 2% moves if this continues.